Morgan Jarvis, owner and professional dog trainer, has over 30 years of experience working and having fun with dogs. As a member of the world famous SuperDog Team for over 20 years, Morgan has toured and performed throughout North America as well as Puerto Rico and Bermuda. She has been highlighted in the feature film Daniel and the SuperDogs and has had appearances on numerous television productions. Morgan is a firm believer in motivational training methods and has conducted seminars in the United States teaching the “clicker method” of dog training. When she’s not teaching, grooming or performing at shows and competitions, Morgan actively competes in Flyball, disc, dock jumping and agility competitions across North America. Morgan has titled dogs in AAC, NADAC and CKC agility events. In 2006, Morgan and her mixed breed dog Blitz qualified for the Skyhoundz Worlds Disc Dog Championship competition in Atlanta, ranking 4th in Canada and placing in the top 25 teams in the world. In 2015, Morgan was selected 1st win on spot at the AAC Nationals in British Columbia with her mix breed dog Tactix for the 2015/16 AAC National Agility team to compete at the IFCS World Championship in the Netherlands. Morgan & Tactix finished just outside the Medals with a 4th place in individual Standard, and 5th place individual Gamble. Morgan and Tactix won another Win On spot with the AAC National Agility Team for 2016/17 IFCS World Championship held in Valencia Spain. They placed 6th overall in the 16" category at the 2016 National Championship held in Montreal, coming home with a first place Standard and 1st Place gamble. Morgan will be heading back to Europe in 2018 with Tactix to compete on the 2017/18 IFCS team in Milan Italy. Morgan currently races on one of Ontario’s fastest Flyball teams — On the Fly, sponsored by K9 Central. 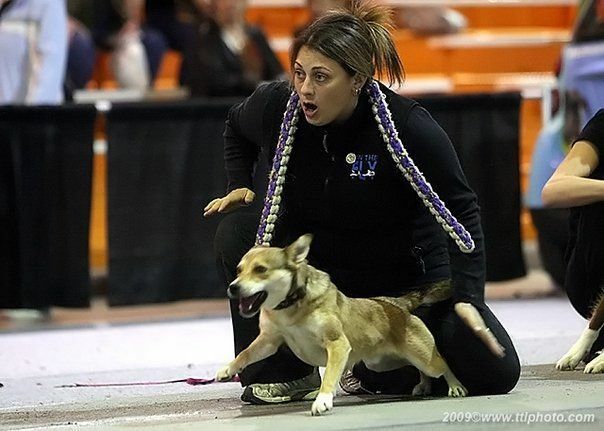 She has trained and titled many Flyball dogs to their OYNX and Grand Champion Awards, and has over 25 years of Flyball competition experience. 2017 was a great year for OTF, as they brought home the Division two regular and Division two Multibreed CanAM championship. Morgan’s newest dog Image has excelled in the Flyball along with Dock Diving, in 2016 Image was the DockDogs, LapDog World Champion with a jump of 22’11” in 2017 they again were able to bring this championship home with a personal best indoor jump of 24” in qualifying. They finished 5th in the Extreme Vertical Cadet Division with a 5’10” Grab. Their overall personal bests in this sport have been a 26’9” outdoor jump and a 6’2” Extreme Vertical grab. Morgan has travelled the world teaching and organizing Flyball competitions. In 2005, Morgan was invited to Japan to organize a Flyball tournament and undertake flyball training seminars. In 2014 Morgan again visited Japan to teach a Dock Diving Seminar. Morgan Jarvis has a diploma in Animal Husbandry. She is a Certified Dog Groomer, and is a member of the Canadian Kennel Club, Canadian Association of Professional Pet Dog Trainers, Ontario Dog Grooming Association, and the International Professional Groomers Association. She has won 1st, thru 3rd place in ODGA grooming competitions and Best Groomed Dog by ODGA member. Morgan has worked with The Toronto Humane Society and The Ontario Society for the Prevention of Cruelty to Animals (OSPCA). Morgan shares her life with Blitz, Tactix, Boost & Image (Mix breed dogs), Trinity a standard poodle, Tango a miniature poodle. Morgan is also very active in Standard Poodle Rescue Ontario and has helped out with many local rescue groups.